Look around you now; what’s your environment like? Is everything in an organized mess? Or do you have dirty clothes due for the washing machine clumped with clean clothes hanging on a chair in your room, while your shoes are thrown all over the place? Are your dishes piling up in the sink attracting ants, flies and roaches? Is the trash still sitting in the bin filling your apartment with odours enough to wake the dead? There is nothing worse than an environment that represents chaos! A chaotic environment affects your wellbeing even though you may not realize it. A chaotic environment affects your productivity in the sense that it keeps you from being able to achieve what is necessary. It keeps you from thinking productively, from assessing information, and from improving yourself. A chaotic environment is not doing you any good. It is simply highlighting the fact that you do not care about yourself. Get up and clean it up! There is nothing attractive (even to your own spirit) about a chaotic and dirty environment. Nothing productive can come out of an environment riddled with junk that ought to be thrown out. If anything at all, it weighs down your spirit and prevents you from connecting with the right frequency of thoughts. It creates a pathway for depression to get to you. Clean up your environment. Throw all the unnecessary stuff out. Put everything else where they should be. Have an orderly arrangement that embraces you with encouragement, peace and positivity when you walk through the door. 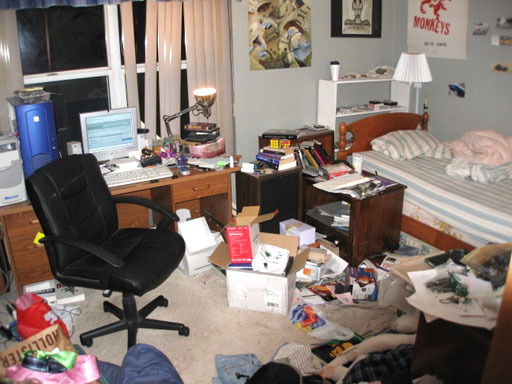 Get rid of clutter! Take the trash out; wash the dishes; fold your clothes, arrange your shoes, and your books! Healthy people don’t sit in chaos. You need order to move to the next level; start with your environment!